"After the Civil War, Americans began observing the holiday that came to be known as Memorial Day in order to commemorate the war dead from both sides. As time went on, we remembered those who died defending our country in all its wars." As I personally reflect each year about Memorial Day I concentrate on the living & think of the graduation ceremony of those in The Long Gray Line. Carol & I have attended several of these graduation ceremonies @ West Point & I always get as close as I can to the new graduates to look into their faces to see their courage & wonder where they are going. I marvel @ their leadership & accomplishment. But you don't have to look farther than the Preamble of our Constitution to find who the Founders regarded as the volunteer defenders of American Liberty - "We the People of the United States...provide for the common defense..." This opening sentence is a strong connection to the right of individuals to "to keep & bear arms" under the Second Amendment. People go into the military for many reasons but just about all of the ones I personally know have or had a calling to serve that required no "thank you" from the nation they defended. "(Washington) lost a great deal of money during the hostilities by paying many things out of his own pocket when Congress could not...& by refusing a salary...(Washington had) a special relationship with his beloved army – the first army of free men of democratic habits in the world...many loved him & lived long to boast that they had fought under him &, on occasion, seen him with their own eyes." So now Apple is taking its turn in the barrel replacing GE who famously got scorched for paying no corporate income tax in 2010. 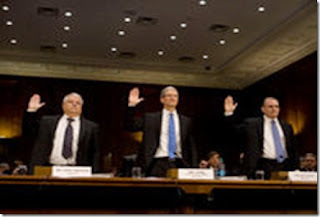 Although Apple paid plenty of U.S. corporate income tax in 2012 they paid virtually no Irish corporate income tax & that has aggravated some senators like John McCain & Carl Levin. Go figure. The one thing Apple & GE have in common is that they each found it better (i.e., less costly meaning more advantageous to their shareholders) to pay tax attorneys & tax accountants who prepared each of their monstrous returns that let them escape paying corporate income taxes than to pay the taxes with no regard to legitimate deductions or business strategies. GE's tax return was 24,000 pages long & Apple measured theirs by height – over two feet. The size of these returns in & of themselves tells you quite an expense & effort went into preparing them. Make no mistake the compliance costs of preparing these returns is embedded in both companies products that we buy. The point is these costs are less than the unbridled corporate income tax costs & submitting their returns the way they did was a sound business decision that saved every consumer, employee, & pension fund holder money. Here is the corporate income tax lesson - people pay corporate income taxes – not corporations. Let's start with the most basic of finance & accounting equations: Revenue – Expense = Profit. Now in order to pay tax on profit corporations must first collect revenue so that if the corporate income tax is derived from revenue it is the consumer who pays this tax when he buys the product – this covers the revenue part of the equation. If employment or wages are reduced to cover the corporate income tax then unknowing job seekers or workers pay the corporate income tax – this covers the expense part of the equation. If neither of the foregoing is immediately possible to cover taxes then the share holders, including individuals & pension funds will have reduced payouts of dividends or capital gains which covers the profit portion of the equation. It is amazing how many people bad mouth corporations like Exxon Mobil, GE, & now Apple (whose products people love) but receive a portion of their retirement income (pension) from these companies – talk about not knowing what is going on. But please understand that in no case will the corporation pay any corporate income tax – only consumers, employees, or shareholders do. Think of your own individual income tax liability – it is based on how much income you make. The same is true of corporations. They do not go about their business all year long - & then @ the end of the year take money out of some stash to pay their taxes - & neither do you. The corporate income tax is really an embedded cost that is priced into products charged to consumers, workers, or shareholders as described above so the higher the corporate income tax rate the less competitive a country's economy will be. This cascades down to investment decisions which will also be influenced by the capital gains tax rate. It is just common sense that the lower the capital gains tax rate the more incentive entrepreneurs have to invest. The optimum condition is for both of these taxes to be zero which they are under the FairTax. Under the FairTax the U.S. would be the only country with zero tax on both production & investment thereby creating a great incentive for foreign companies to increase their presence in America - with plants, offices, & jobs. In summary, business spending on new plants, equipment, offices, & labs indicates expansions that will produce quality jobs with good wages & it is the FairTax replacing the corporate income tax & the capital gains tax that propels this rejuvenated economy & middle class. It is hard to get this message across with so many of our elected representatives being so economic illiterate either naturally or by political calculation designed to keep the citizenry dumbed down. Attending town hall meetings to let them know we know better & have the answer to our problems in the FairTax might start to change their false outrage regarding companies like Apple. Once you know for sure they know better, and still fake outrage, just don't vote for them ever again. Now Professor Drucker takes all of this to another economic level with his quote I presented above. We all know from the last posting & many other sources that Congress has expressed much outrage over the recently exposed IRS abuses of power. The question is how much of the outrage is real or feigned? Click here to hear Tara Setmayer, Communications Director for California Congressman Dana Rohrabacher, engage in a lively debate on the May 18 edition of Huckabee on FNC in which she offers the solution to so many of our economic & political problems by proposing that Congress "fix the tax laws" by enacting the FairTax. Tara is an excellent debater with a good grasp of the facts & a smile that helps win the audience over. Every bit as impressive to me is that the congressman she works for is not a FairTax cosponsor & yet she endorses it. Tara's debate opponent, Elie Mystal, sat there defending "nothing". 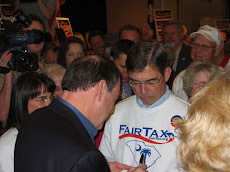 Governor Huckabee ended the program by pointing out that the FairTax not only transforms the economy but abolishes the IRS meaning that under the FairTax you do not pay your federal taxes to a government agency like the IRS but rather when you use or consume a service or new good in the U.S. You do not keep or file any records with the government so there is no chance of the type of audit abuse that has recently taken an ax to the very bedrock of our founding principles – all per BO's design. Right from the actual legislation – the FairTax is a Bill "To promote freedom, fairness, and economic opportunity by repealing the income tax and other taxes, abolishing the Internal Revenue Service, and enacting a national sales tax to be administered primarily by the States." 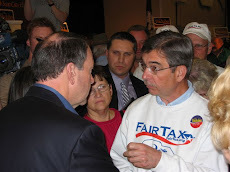 The FairTax Plan is a nonpartisan proposal that replaces all federal taxes on individual & business income, as well as payroll, estate, & capital gains taxes with a 23% (tax inclusive) national consumption tax on both personal & government consumption of new goods and all services in the U.S. The FairTax taxes only the final consumer or user of new goods & services in the U.S. meaning essentially it taxes retail sales & government consumption. If eliminating IRS intrusions that have gone way beyond the pale is important to you please help spread the FairTax word. You can start by telling your next door neighbor the next time you see him. Last week the Heritage Foundation released their much awaited report entitled The Fiscal Cost of Unlawful Immigrants & Amnesty to the U.S. Taxpayer that calculated the net cost to taxpayers for the amnesty portion of the Senate bill currently working its way through committee to be $6,300 billion 2010 constant dollars. The lead author is Robert Rector who used the same accounting framework for the report that the National Academy of Sciences uses for similar reports. 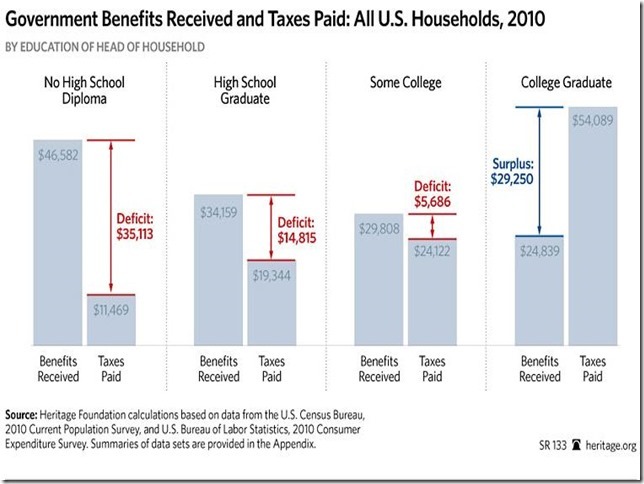 See top left graph - Government benefits & services received include 1) direct benefits like unemployment insurance & workers' compensation, 2) means tested welfare benefits like food stamps & housing assistance, 3) public education, & 4) population based services like police & fire protection. 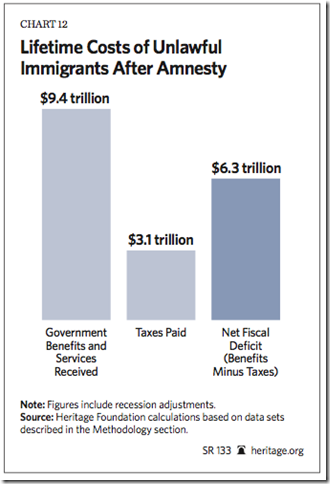 The net fiscal deficit shown on the graph must be financed by taxes from legal households or by government borrowing. The report was not received well by many usual Heritage allies like the Cato Institute, Grover Norquist, Steve Moore, & of course members of the Republican Party who are in favor of the 844 page comprehensive immigration reform bill – lead author Marco Rubio – that is still being written meaning it will get longer. Many critics attacked the methodology of the Heritage report saying that contrary to empirical evidence, the report assumes no increased economic efficiency from immigration, no benefit from additional workers, no economic mobility, & accordingly did not use dynamic scoring. Now Robert Rector is just about the last person in the world I would want to debate challenging his stats & methodology so good luck with that approach. Rector is a respected expert on welfare use & helped write the 1996 welfare reform law. But let's put all of the technical points aside for a moment & just try to use a common sense analysis. Over half of unlawful immigrant households are headed by someone who on average has a tenth grade education & another twenty seven percent are headed by someone with a high school education meaning that more than three quarters of these people will be significant tax consumers – see top right graph. Doesn't it seem obvious that these 11.5 million individuals will tend to have low wages and pay comparatively little in taxes compared to the benefits they will consume? With re to the lack of dynamic scoring criticism – I point out that government will get even bigger over the years offering even more than the current eighty means tested welfare programs thereby increasing Rector's numbers. Also Rector did not include the cost of family members coming to America that is part of the bill. The report does not examine the cost of future chain-migration spurred by the pending Senate bill. It does not look at the tax impact of the bill's provisions that would bring in another 20 million people, nor on the chain migration spurred by those 20 million immigrants. Most of the current illegals – & their extended families - are low-skill workers, ensuring they already receive more in federal benefits than they pay in taxes. The deception used by Rubio is his claim that no federal benefits will be paid to unlawful immigrants for the first thirteen years under the pending bill – just outside the ten year window the Congressional Budget Office (CBO) uses to calculate the effect of every proposed legislation. This sounds good & Rector acknowledges that if no federal benefits are paid that the deficit will be reduced over these first thirteen years; but Rector did a full lifetime analysis & the later years are the ones that overwhelm any initial contributions made by the unlawful immigrants. The reality of benefits being non-existent for thirteen years is another matter that I would have to see to believe. Now this disagreement revolves around politicians on one side (virtually all Democrats who smell blood in the water thinking 75% of unlawful immigrants who gain citizenship from the pending bill will vote for them & some Republicans who think that they have no place to go but up with Hispanics after Mitt received only 27% of the Hispanic vote in the last presidential election) & on the other side people like those @ the Heritage Foundation who are interested in the preservation of the country & not just getting some politician reelected. The Heritage report says "Unlawful immigration...makes it harder for the least advantaged U.S. citizens to share in the American dream. This is wrong; public policy should support the interests of those who have a right to be here, not those who have broken our laws." This Heritage point is hard for many principled people to get past. A person who wants to start a new life in America by arriving @ midnight hiding from border guards in the trunk of a car is not likely to contribute to the foundation to build our future upon. In addition to Rubio the immigration legislation is promoted by seven senators (known as the Gang of Eight) who represent states with large foreign born populations (except for Lindsey Graham of SC who has a habit of following McCain on many issues). The Gang's motivation for supporting the bill starts to make sense when you see the make-up of their constituents. All of the immigration reform discussions of the past quarter century have broken down because of lack of enforcement – for instance the 1986 Immigration Reform & Control Act gave immediate amnesty to almost 3 million people but there has not been even one single day since passage of the bill that its enforcement provisions have been followed. The pending immigration legislation legalizes nearly all of the 11.5 million unlawful immigrants within six months but leaves the southern border porous & corrects any continuing problems by appointing a commission after five years to make recommendations re corrective action. What enforcement mechanisms that are in the bill apply only to seaports & airports but not land check points & an e-verify system begins for all employers only after five years. Rubio admits this is weak. Professor Friedman famously said that you can have open borders or you can have the welfare state, but you cannot have both & of course we have had both for decades & the Rubio immigration bill continues this. The first laws limiting immigration to America were in the 1920s. Originally people came to America for freedom & to work because there was no welfare – these people assimilated & made America stronger. When a politician says today "we are a nation of immigrants" he is making a misleading pitch for patriotism & our heritage; for decades immigration, as regulated by the federal government & its welfare programs, has significantly contributed to the Death Of Democracy of the American Republic. Rubio says we have de facto amnesty now because it is obvious to him that the 11.5 million unlawful immigrants are not going home meaning they have won & it is just a matter of how much. The Heritage report was barely released @ a news conference last week when the attacks instantly started by people who are primarily interested in being reelected or are heavily invested in seeing their favorite politician get reelected - as has become the custom in Washington these people had not had time to read the Heritage report before attacking. Wouldn't it be better to address the Heritage calculations & methodology with point by point technical rebuttal so that all of us would know what is real? Can we afford to find out that the Heritage report is correct but we ignored it because of promises from politicians from states with large foreign born populations? Politicians love power & know that the citizenry has taken liberty & freedom for granted far too long meaning we are ripe for abuse & having our life savings legally taken from us & given to the poorest, lowest skilled, most uneducated people in the world in exchange for votes. Accordingly the real benefit of the comprehensive immigration reform legislation goes to the politicians who want to get reelected thereby staying in office into perpetuity. The cost presented in the Heritage report, if correct, will not affect their lifestyles but it sure will affect all of the rest of us – if we let them get away with it. Jim DeMint, president of the Heritage Foundation, favors step by step immigration reform instead of one big comprehensive piece of legislation like the Gang of Eight is proposing. 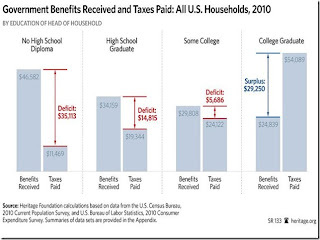 Looking @ the above right graph isn't it again just common sense to start DeMint's approach by increasing the issuance of visas, green cards, & paths to citizenship for the type of college graduates that produce a surplus of taxes paid over government benefits received. In this way taxes on all Americans can ultimately be reduced because the new immigrants don't require all of the government benefits & services that the last wave of immigrants did. 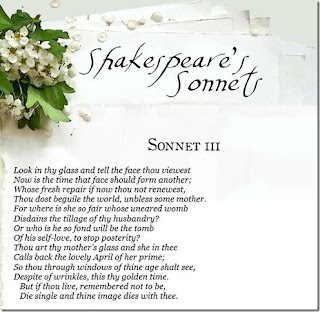 Thanks to my friend Anne Neal, president of American Council of Trustees & Alumni (ACTA), for sending this Mother's Day tribute by the Bard. Click on it to enlarge. Even if we never did know what money is we do know that its value only comes from private sector people working & investing that results in a vibrant economy – it is also true that government can destroy the value of money by borrowing or taxing the private sector into oblivion. With re to people working in a vibrant economy – we still have anything but. Although the headline number of the decrease in the unemployment rate in April to 7.5% sounds like progress the underlying trend has not changed much @ all. See stats below from the Bureau of Labor Statistics (BLS). The civilian labor force participation rate was 63.3% in April, unchanged over the month but down from 63.6% in January. The employment-population ratio, 58.6%, was unchanged over the month and has shown little movement, on net, over the past year. In April, the number of persons employed part time for economic reasons (sometimes referred to as involuntary part-time workers) increased by 278,000 to 7.9 million, largely offsetting a decrease in March. These individuals were working part time because their hours had been cut back or because they were unable to find a full-time job. There were 2.3 million persons marginally attached to the labor force in April, essentially unchanged from a year earlier. These individuals were not in the labor force, wanted & were available for work, & had looked for a job sometime in the prior 12 months. They were not counted as unemployed because they had not searched for work in the 4 weeks preceding the survey. And worst of all the U-6 unemployment rate increased in April to 13.9%. U-6 is the most comprehensive measure of unemployment & currently totals 21.9 million people. It includes the total unemployed (11.7 million), plus all persons marginally attached to the labor force (2.3 million), plus the total employed part time for economic reasons (7.9 million). These numbers should seem familiar to RTE readers because they are little changed from previous postings. Of course the real question for those who found employment is how does your total compensation compare with what you were earning before losing your job? Unfortunately we know the answer is not good & with ObamaCare steaming along employers will be less likely to increase hiring - the 30 hour per week cut off rule for determining whether someone is part time or full time will only exacerbate this situation resulting in more involuntary part time workers. The answer for many people over the past several years has been for families to move in together with every able bodied person getting whatever mediocre job they can find & of course topping this off with government benefits & their own wealth spend down. What a way to make ends meet. This family consolidation trend includes college graduates returning home with no job or job prospects. If parents are not careful their wealth spend down hurts their own retirement plans. The WSJ reports 22.6 million adults between 18 & 34 living with their parents, 26% of the parents have taken on debt because of the kids living with them, 7% of parents have delayed their retirement because of the kids moving back in, & 30% of parents gave up privacy due to their adult children. All of this deterioration of America is exactly what BO is working for. 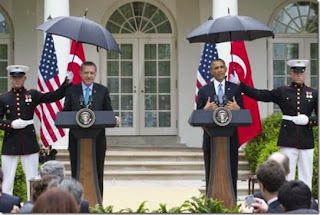 BO didn't create all of this but he sure came along @ the right time to accelerate it. In that way it is a blessing if only because it is so much more obvious than if we continued on a slow burn that was less noticeable. The deterioration presented above & in many other postings have effects far beyond economics. For instance the murders of four Americans in Benghazi, Libya on September 11, 2012 has attracted no interest from anyone starting with Mitt Romney during the presidential debates last fall. In times past Benghazi would have been important if people had satisfied their employment needs; but since they haven't they have no time for such matters apparently not caring @ all that Hillary & BO may be involved in a cover up plot that makes Watergate look petty anti. Now what the American people care about and where they are heading will be revealed if Hillary & BO are proven to be up to their necks in the Benghazi murders & then either Hillary or MO (more likely) gets elected president in 2016. Thanks to Mike Proto for providing this link for a website re Tax Freedom Day – the date originally calculated in 1948 by a Florida businessman that vividly shows the cost of government by determining the date the nation as a whole has earned enough money to pay its tax bill for the year. The earlier the Tax Freedom Day the better – in 2013 it increased five days to April 18 – the 108th day of the year meaning that the average American draws the first dollar he could use for himself on April 19. The website explains that the first step in determining Tax Freedom Day is to divide all federal, state, and local taxes by the national income. In 2013, federal tax receipts are expected to be $2.76 trillion & state & local tax receipts are expected to be $1.45 trillion, for total tax revenue of $4.21 trillion, or 29.4 percent of national income. The period from January 1 to April 18 is 29.4 percent of the calendar year. You can click on the above website & find virtually any information you can think of including each state's ranking, an analysis that adds borrowing costs known as the deficit-inclusive Tax Freedom Day (May 9 in 2013 – just 12 days short of the record), & facts like Americans spend more on taxes than they do on food, clothing, & housing combined & in 1900 state & local taxes made up the great majority of the total tax burden & Tax Freedom Day was January 22. With re to the state rankings I will save my northeast neighbors some time – #1 CT (May 13), #2 NY (May 6), #3 NJ (May 4), #4 tied MA & IL (April 25). Now all of this information can be of value to you. It sure was to economist Arthur Laffer when about three years ago he implemented part of his exit plan & moved from # 6 CA to # 48 TN. As you peruse the website & look @ all of the taxes listed I'll bet many of you will wonder more than ever why we put up with this & why the FairTax has not been enacted. Under the FairTax the true costs of running government will become visible for the first time as everyone sees what portion of their spending goes to finance federal government spending. 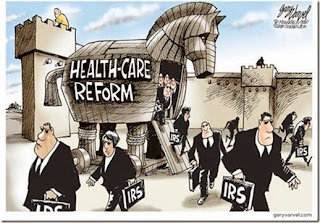 People may start to take a closer look & when they do the earmarks & pork barrel spending that politicians thrive on to get reelected will disappear. Not only will the FairTax put tax attorneys & tax lobbyists out of business – it will also put career politicians out of business in effect creating term limits because the great powerful jobs will no longer be in Washington. The biggest benefit to me of Americans becoming more aware of the size of their tax payments is that they will insist on the spending cuts necessary to lower the government's claims on their earned income so that the FairTax rate will be lowered, along with state & local tax rates, until ultimately Tax Freedom Day becomes 12:01 AM on January 1 of each year.